The aim of this article is to explore an alternative clear aligner technique. Identify some history of early overlay appliances. Recognize some of the methodologies behind aligner mechanics. Realize some of the necessary aspects of aligner design for effective tooth movement. Realize that aligner materials need to have specific properties for efficient tooth movement. Identify some characteristics of the Orthocaps® system that make it a viable alternative aligner system. Overlay appliances have been used in orthodontics for more than 90 years. In the early days, such appliances were shaped like positioners; that is, formed as single-unit appliances having tooth cavities to receive both upper and lower teeth. In 1945, Dr. H.D. Kesling published a landmark article in the American Journal of Orthodontics and Dentofacial Orthodo-pedics entitled “The philosophy of the tooth positioning appliance.” Kesling described the making of a set-up model after teeth had been cut out from a plaster cast and repositioned in wax on the model base. The “Positioner” was thus formed as a negative of the model that had been created by repositioning teeth in wax. Kesling, who was granted a patent in 1945, mentioned the fact that if the extent of tooth movement was beyond the scope of a single appliance, more than one appliance could be used in sequence to move teeth. Drs. McNamara, Ponitz, Nahoum, Sheridan, Rinchuse, and others also described the use of overlay appliances that took the form of modern-day aligners to achieve orthodontic tooth movement. As the use of CAD/CAM became common in dentistry in the 1990s, the concept of using digital 3D scanners and rapid prototyping technology became apparent in the manufacturing of aligners. Dr. François Duret, a French innovator and dentist, used CAD/CAM techniques to construct dental prosthetic and restorative units as early as 1983. In 1996, researchers like Alcañiz and Hemayed, separately described in detail the use of CAD/CAM techniques to create computerized set-ups and rapid prototyping (RP) models, for diagnostic and therapeutic purposes in orthodontics. In 1998, Align Technology commercialized the production of aligners using such CAD/CAM techniques in the United States. Although the Invisalign® system is the most widely used, some companies like Ortho Caps GmbH (Germany) and others, offer alternative aligner techniques, like the Orthocaps® system to Invisalign®. The mechano-transduction (transmission of force) of orthodontic forces, triggers a tissue response that results in orthodontic tooth movement. Teeth and the surrounding tissues do not differentiate between force generated by aligners or any other type of appliances. The factors that determine the quality and quantity of orthodontic tooth movement depend greatly on the force-system that is used, including the amount of force, its duration, dynamics, and the underlying tissue response. It is therefore imperative that the design of the appliances, the material property of the thermoplastics, and the interface between the tooth and the appliance are conducive to creating a force system that ensures a controlled, effective, and safe tooth movement. Aligners are removable appliances and are therefore inherently at a disadvantage when compared to fixed appliances. The aligner-tooth interface is mechanically less efficient in transmitting orthodontic force to the surrounding tissues as compared to systems based on brackets and wires. To overcome this disadvantage, appliance design must incorporate features that enable the aligners to have a good grip on teeth and allow the aligners to have a maximum surface contact with teeth. A variety of thermoplastic materials are available that can be used for manufacturing aligners. These materials differ not only in their composition and thickness, but also in properties such as elasticity, which is essential for tooth movement. The choice of material depends on the type and amount of tooth movement, required force levels, and the condition and health of the under- lying tissues. As mentioned previously, to transmit force effectively, it is important to create an interface (contact area) that allows the transmission of force without a) loss of magnitude, or b) directional control, or both. This requires an exact aligner-fit, as well as an accurate reproduction of the tooth surface and the interdental areas in models that are used to manufacture aligners. Aligners manufactured on such models, have the required “fit” on the teeth to achieve a good grip. The Orthocaps system is designed to address core problems that many aligner systems have — namely, the inability to transmit force to teeth without mechanical or directional loss, and the lack of adequate control while delivering forces that move teeth accurately in all 6 degrees of freedom (x, y, z — axes translation and x, y, z — axes rotation) in 3D space. For this reason, the system emphasizes the use of elastic materials in the fabrication of aligners. The Orthocaps system also uses two different types of aligners (a day aligner and a night aligner) for each treatment step. This technique ensures that optimal forces can be generated by selecting different thicknesses of elastic materials that are used for aligners that are worn at night or during daytime. In the Orthocaps® system, an exact “aligner-fit” is of paramount importance. Modifications to aligner design, like pressure points, dents, divots, or certain type of structures like power ridges, etc., that are used in some other systems to direct force to certain areas on clinical tooth crowns, are thought to be counterproductive. These modifications result in spaces and voids (Figure 1) that are created between the teeth and aligners and therefore reduce the grip of the aligners on teeth. The main design feature for the Orthocaps aligners is thus the ability to encapsulate the teeth completely. This allows the maximum surface of the teeth to be in contact with the soft inner aligner layer which is more elastic than the outer rigid aligner shell (layer). High-pressure thermoforming techniques also facilitate the aligner material to flow into the interdental areas, thereby increasing the surface contact area with the aligners. Material elasticity is the foremost property that is needed in achieving controlled tooth movements. Elastic deformation of aligner material generates the force that is required to move teeth. Elastic material can be deflected or deformed without losing their shape or form. This deformation is generated due to the difference in the position of teeth between the set-up model on which the aligners are fabricated and the actual position of the patient’s teeth. If the aligner material is elastic, the aligner regains its original shape completely when it is removed from the mouth. This means that the aligner remains active and continues to exert a force until it returns to its original form and thereby moves the teeth effectively. To the contrary, inelastic and rigid materials undergo a plastic deformation (Figure 2) even at lower deflection levels (strain) and thus lose their form and therefore are unable to move teeth. This explains why inelastic materials for aligners are not as effective as elastic materials. In the diagram (Figure 2), the material stress is plotted along the Y-axis. The amount of stress is the force in Newtons (N) divided by area m2. The material strain or deformation is measured as a percentage of deflection from the original state of rest. For linear deformation, this is calculated as the increase in length (∂l) divided by the initial length (L). The elasticity (modulus of elasticity E) of a material is shown by the gradient of the curve and is calculated by dividing stress by strain as shown in the equation below. Bending, stretching or deforming a material beyond its elastic limit results in plastic deformation of the material. It is important to remember that elasticity is a material constant and does not depend upon the thickness or geometry of the material. The same degree (%) of deflection or strain would result in permanent deformation of a given material regardless of its thickness or shape. Orthodontic movement is thus caused by the rebound force that makes the elastic material regain its original state or shape. This force is directly proportional to the area, modulus of elasticity, and the deflection or strain the material undergoes, provided that the material is not strained beyond its elastic limit as shown in Figure 2. Many types of attachments can be used to increase the efficacy of tooth movement with Orthocaps. The use of soft and elastic materials also makes it easier for using attachment types that would be otherwise impossible to use with rigid or hard materials. Some of the attachment types are shown in Figure 3. Apart from normal attachments, a new type of “attachment” was developed at the Orthocaps Center in Germany. Called “Friction Pads,” these attachments consist of a flat textured surface that is bonded to the tooth to increase the friction between the inner aligner surface and the tooth. The advantage of using the “Friction Pads” is that these textured surfaces are only a fraction of a millimeter thick, making them almost invisible under normal circumstances and therefore more acceptable to patients. Figure 4 shows the CAD model of the friction pads on two teeth. The attachments or friction pads are bonded to the teeth by indirect bonding techniques. Pre-formed attachment or friction pads are sent to the clinicians placed in the first aligners ready for indirect bonding. Figure 5 shows the friction pads bonded to several teeth. As can be seen in the pictures, the friction pads are only visible at close inspection. This esthetic advantage of friction pads over regular attachments make these type of bonded retention aids much more acceptable to patients seeking an invisible treatment option. Comments: This young adult female patient was treated for upper and lower crowding and deep bite. Orthocaps Pro system was used without any auxiliaries. Appliances used: Orthocaps aligners, BiteMaintainer. Comments: This young female teenager was treated for Class II bite correction and deep bite. Orthocaps Pro system was used without any auxiliaries. Towards the end of the treatment, a BiteMaintainer was used as an active retainer. Appliances used: Orthocaps aligners, TADs to distalize molars. Comments: This 45-year-old female patient was treated with a distalizing apparatus based on TADs followed by Orthocaps aligners to correct the overjet and a mid-line deviation. Comments: The treatment for this 12-year-old was started in the mixed dentition and was completed with Orthocaps Pro. No auxiliaries were used in the entire treatment. Comments: This 33-year-old female patient was treated for posterior crowding. The upper right first molar was extracted and the space closed by moving the second molar into the extraction space with aligners. At the end of the treatment, Orthocaps provided a lingual auxiliary, comprising four lingual brackets and a pre-ligated nickel-titanium wire within an indirect-bonding tray to bond the appliance. Subsequent aligners were designed to immobilize the two pre-molars, while allowing the second molar to upright. 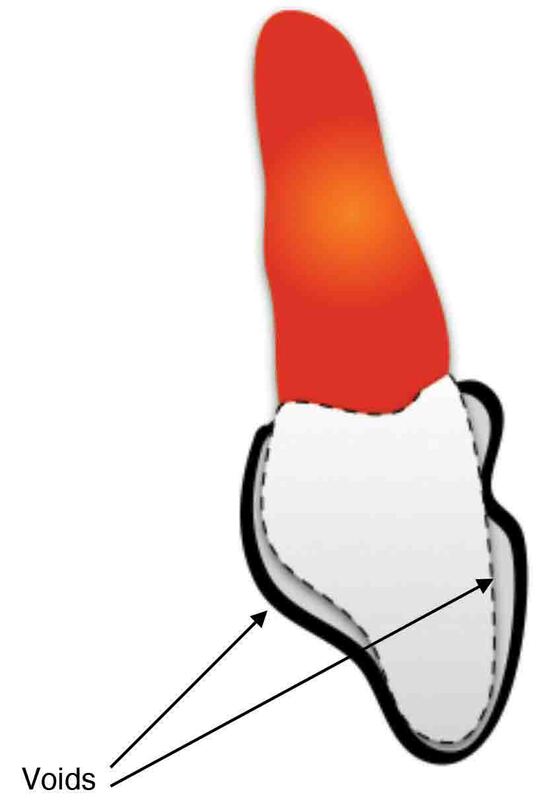 This design created the necessary anchorage in order to upright the second molar effectively. As the demand and need for esthetic orthodontic treatment alternatives grows, aligners have secured a firm place in the orthodontic repertoire. However, the inherent disadvantages associated with the use of removable appliance, such as aligners for orthodontic tooth movement, pose great challenges in improving their efficacy. The Orthocaps system is an effort in that direction. Dr. Wajeeh Khan is the founder and owner of Ortho Caps GmbH, a company based in Germany dedicated to developing and improving invisible orthodontic treatment techniques using clear aligners. Prior to this position, Dr. Khan was in orthodontic private practice since 1996. He has given over 100 lectures in symposia and universities across Europe. Dr. Khan holds a Doctor of Dental Medicine from the University of Münster, Germany (1989), and has postgraduate training in orthodontics from University of Münster (1996). He is a Fellow of the World Federation of Orthodontics and is a Member of the American Association of Orthodontics. Remensnyder, Orrin: A gum-massaging appliance in the treatment of pyorrhea, Dent. Cosmos 48: 381-384, 1926. Kesling, H. D.: The philosophy of the tooth positioning appliance, AMER. J. ORTHODONT. ORAL SURG. 31: 297-304, 1943. Nahoum, H. I.: The vacuum-formed dental contour appliance, New York J. Dent. 30: 385-390, 1964. Ponitz RJ. Invisible retainers. Am J Orthod 1971; 59:266-72. McNamara JA Jr, Kramer KL, Juenker JP. Invisible retainers. J Clin Orthod 1985;19:570-8. Sheridan JJ, LeDoux W, McMinn R. Essix retainers: fabrication and supervision for permanent retention. J Clin Orthod 1993;27: 37-45. Rinchuse DJ, Rinchuse DJ. Active tooth movement with Essix- based appliances. J Clin Orthod 1997;31:109-12. Duret F., Blouin J. -L., and Duret B., “CAD-CAM in dentistry,” J. Amer. Dent. Assoc., vol. 117, pp. 715-720, Nov. 1988. Alcañiz, M., Chinesta, F., Monserrat, C., Grau, V. and Ramón, A. (1996) An advanced system for the simulation and planning of orthodontic treatments. 4th Int. Conf. of Visualization in Biomedical Computing, Hamburg. Hemayed E. E., Yamany S. M., and Farag A. A., “3D model building in computer vision with orthodontic applications,”Technical Report TR-CVIP 96, CVIP Lab., University of Louisville, Nov. 1996. Khan W., Kieferorthopädische Behandlungen mit einem neuen Twin-Aligner-System (Orthocaps). Inf Orthod Kieferorthop, 2009 vol. 41 (03) pp. 175-182. Krishnan V, Davidovitch Z. Cellular, molecular, and tissue-level reactions to orthodontic force. Am J Orthod Dentofacial Orthop 2006; 129: 469e.1–460e.32. Proffit WR. Contemporary orthodontics. 3rd ed. St. Louis: Mosby; 2000: 304.